Many subscribers will have received a form telling them that their subscription has now run out. I do hope they renew as, otherwise, they will miss so much. From the January issue Acumen will revert to its normal larger issue (120pp or over) and also by then we hope to have the new, more informative website up and running. 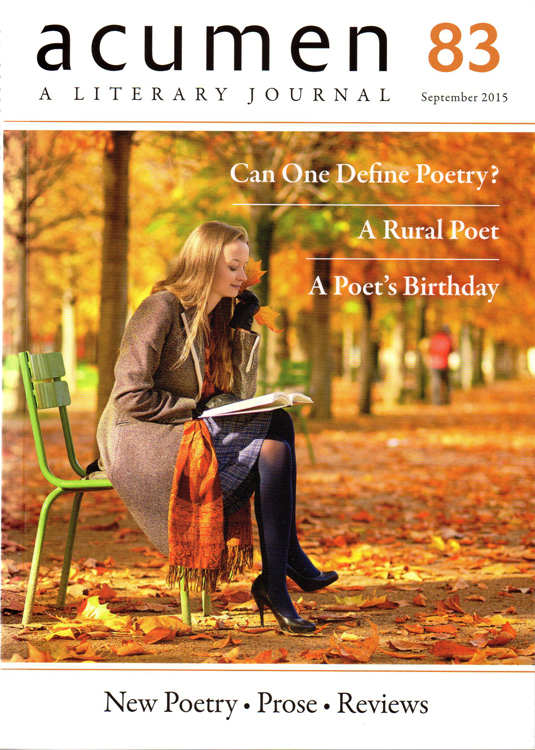 This will not only include clearer details of how to subscribe and submit, but dedicated news pages, poems and views, and a page for young poets (which the advisory editor and I have decided to be up to 25 years of age!). 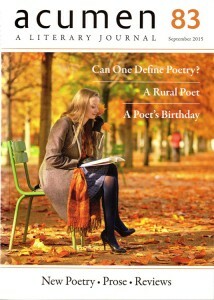 There will also be easy links to other websites of poetic interest, as well as Acumen’s facebook and twitter pages. In time, there will also be a substantial archive of all the issues of the magazine, which will include poets, books reviewed, prose writers etc. The editors are very excited about this development and, once you have seen the website, I know you will be too. However, as well as exciting news, there are also some rather less favorable developments: overseas rates to the magazine have had to be raised considerably. Non-UK mailing costs have soared in the past three years and regrettably, after realising that overseas subscriptions weren’t even breaking even, we have had to raise the prices. It is not only the post office which has been charging more, but banks, too, have now raised their prices for converting foreign cheques into sterling. But Acumen will now offer, for a much lesser sum to cover only artistic costs, to send a pdf copy to any subscriber / institution who is happy to read the magazine on line or print off poems or articles which are of greater interest for themselves. If you are interested, please send an email to patriciaoxley6@gmail.com for further details. And so, belatedly, to this issue. I hope you find the poetry as interesting as I do; there is a great range within these pages from the moving, to the humorous to the thought-provoking. I know Acumen readers are discriminating and have their own views (see Responses) but it would be good to hear more for publication.